The Wilmington Salt Works began operations in 1861 in response to severe salt shortages. Early in the Civil War the Union Army destroyed salt works in Currituck County and later near Morehead City. The Wilmington works was the only operation able to continue salt-making until Union forces destroyed it in April 1864. The Cape Fear Museum interprets salt-making as part of a section on the Wilmington Salt Works in its Civil War exhibit (shown above right). A simple public program with salt can be a great way to introduce the Confederate supply crisis of 150 years ago. A new company, Carolina Salt Works, is now operating in Shallotte, only about 35 miles southwest of Wilmington near the South Carolina border. 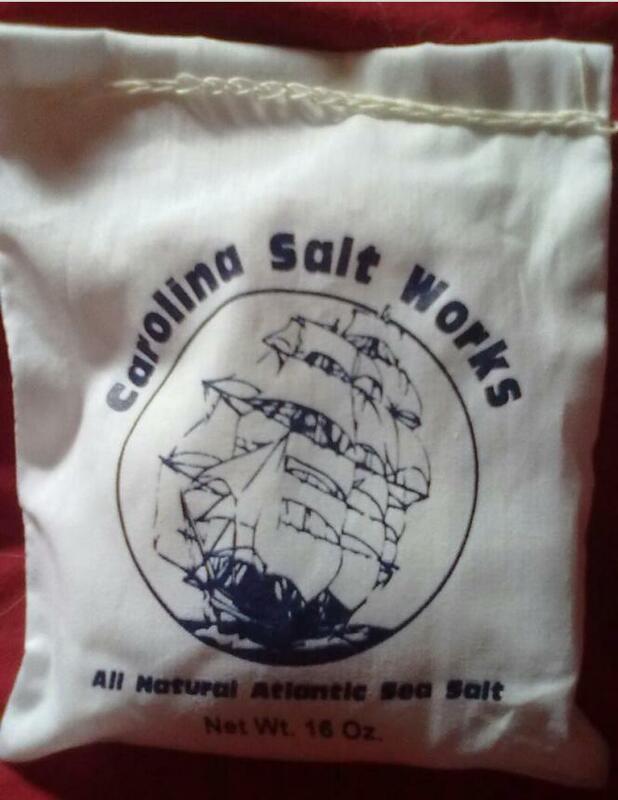 According to the verso of the product package (the cotton sack shown above) Carolina Salt Works gathers seawater during the full moon and produces the salt as a residue of natural evaporation. This process is much like the salt-making on the North Carolina coast during the Civil War. But is salt safe to use in programs near artifacts? There are preservation reasons to keep a salt taste-testing activity away from artifact collections. The science behind salt as an agent of deterioration is complex and involves increased condensation from ambient RH and surface crystallization. But with proper precautions, salt can help museum program participants make a flavorful and memorable connection to the past. Thanks to one of our project partners, NCPC, for this guest post. North Carolina’s Most Endangered Artifacts is a statewide preservation awareness and fundraising campaign sponsored by the North Carolina Preservation Consortium that promotes the survival of tangible heritage in our state’s archives, historic sites, libraries, museums, and other collecting institutions. From North Carolina’s mountains, through the Piedmont, to the coast, artifacts attract students, scholars, and tourists. Native North Carolinians and newcomers enjoy a quality of life enriched by artifacts of history and culture. 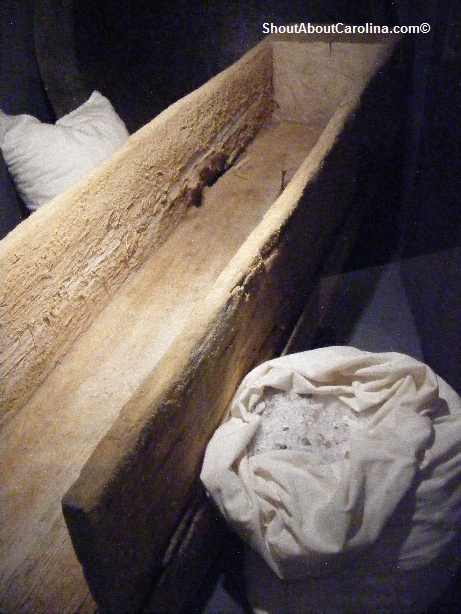 Artifacts are used for education by school teachers, college and university professors, and people engaged in life-long learning. These artifacts include paintings, sculpture, ceramics, furniture, textiles, rare books, manuscripts, documents, maps, photographs, films, sound recordings, natural history specimens, monuments, and historic structures. Connecting with an artifact can be a transformative experience so significant artifacts are placed in the stewardship of cultural institutions. We trust that artifacts there will endure. Unfortunately, many artifacts in our state’s cultural institutions are in danger. All artifacts decay over time due to the internal vice of their composition. Temperature, humidity, light, and pollution are harmful. Hurricanes, fires, and floods are also risks. Even long-term exhibition and handling can damage artifacts. Conservation can save damaged and decaying artifacts for future generations. Professional conservators apply art and science to their craft. However, it can be costly. North Carolina collecting institutions need your help. Many do not have the funds to pay for conservation. Without intervention these artifacts will perish. To nominate an artifact for NCPC’s new campaign, click here. Are we vulnerable to serious flooding again this summer and fall? Who remembers this headline? I sure do, and not because I had any major weather damages, or worked for NC Emergency Management at that time. I remember for two reasons: 1. After experiencing the severe damages of Hurricane Fran in 1996, no one in eastern North Carolina thought that the aftermath of Hurricane Floyd could be worse. And 2.) I was working at summer camp both summers of 1996 and 1999. I clearly remember how very wet those summers were because of the constant re-arranging of programs due to rain, thunderstorms, minor flooding and muddy lakes. Therefore, once again, C2C is here to remind you that no one is exempt from disasters and that now is a good time to take stock of your facility’s current situation. Is the list of emergency contacts/phone numbers updated? Are your visitors and employees aware of safety drills and procedures? Have the storm drains in your area been cleared? Please take time to evaluate your site and collections, especially basement and attic storage areas. Check for leaks in the roof, walls, windows, and doorways. Be sure storage items are up off the floor in the basement. The preferred distance is 6 inches, but if things can be stored higher, please do so. Consider setting up temporary tables, extra shelving, using the tops of desks and any other creative way to protect the wonderful and special artifacts for which you are responsible. Tarps are a good stopgap measure to protect large areas from drips, or leaks. Take time to look outdoors and see if there is potential for damage from gusting winds. Please call C2C with any questions you might have about preparation, prevention, or recovery. Remember that CREST is available for recovery assistance for all NC cultural heritage collections. We hope that all of this is wasted time and energy and that everyone remains high and dry throughout the upcoming storm season – but please prepare your site in case the heavy rains cause flooding or structural damages. P.S. Just to ponder: Do you know what FEMA calls yard art? NC State public history students tour behind the scenes to view museum objects. North Carolina offers 7 graduate training programs to prepare masters’ level history students for museum careers. These are, from west to east, Western Carolina University, Appalachian State, UNC Charlotte, UNC Greensboro, NC State, UNC Wilmington, and East Carolina University. Most of these programs are concentrations within a public history degree program. These programs have served as a resource in our region, offering qualified and ready graduates to fill a range of openings in museums and historic sites. However, the numbers of freshly minted M.A.s in this field each year compares unfavorably to the number of job openings. UNC Greensboro has one of the largest and most robust museum training programs within its public history track. It produces 8-10 graduates yearly. Last year’s class at NC State consisted of 13 public history master’s level students. If each student’s summer internship selection was any indication of her career preference, 8 of those were museum-career hopefuls. Several of the other programs are somewhat smaller. So, let’s estimate that, on average, 6 students graduate each year from each of the 7 programs. Are there enough jobs to absorb them statewide, regionally, or even nationally? Most months the North Carolina Museums Council’s website posts up to 3 job openings. 42 graduates to 36 openings annually doesn’t look too bad, right? But consider the range of postings from very part-time work at $10/ hour to more advanced positions in the $50,000 salary range. Also consider that 1/3 to 1/2 of these postings are for jobs in art and science museums, employers which often prefer candidates with graduate degrees in those fields. Complicating the picture is that many jobs in museums do not go to candidates with museum studies backgrounds. Museums, often struggling financially, tend to bring in leaders with proven fundraising experience and business or legal acumen. Similarly, many mid-level museum positions require expertise in facilities management, human resources, or technology. How often are public history or museum studies graduates attractive for these positions? The fresh M.A.s are often perfectly positioned for the $10/ hour, 20 hour/ week jobs (which usually require weekend and holiday work), but at the upper employment levels, diverse skill sets often become more valuable to museum employers. In addition to growing demand, there are also incentives from the supply side of these degree programs. Adding graduate degree programs serves as a revenue source for universities. Museum studies/ public history courses can also be an attractive recruitment and retention feature for history professors who enjoy graduate-level teaching. One positive attribute of most of these museum studies training programs is the internship requirement. Not that it is often paid work, which would help off-set the costs involved in the degree. Rather, internships are a chance for these museum-career hopefuls to observe closely. How many long-time museum workers seem satisfied with their jobs? Does the institutional leadership offer opportunities for mid-level staff to develop new/ creative ideas? How many workers in mid- and upper-level positions have degrees in history or museum studies? What proportion of museum employees have to moonlight in order to pay off student loans? These are tough questions but important for those students who hope for a museum career to try and answer before making long-term investments in the field. Remember that of North Carolina’s nearly 1,000 cultural heritage institutions, volunteers completely staff more than 1/4. (Stats from the NCECHO survey; see p. 27 of final report.) When so many museums keep chugging along with the dedication and determination of un-paid staff, justifying the need for paid professionals is challenging.